Wetat begashaw kesenbet timihert bet yaefe timihirt yelewim lemilew tiru ababal new gin senbet timihirit betim huno siriatin yeemare sayihon sefer eyawideledelu rasachewin eyadameku siboteliku yeneberu nachew. Mahebere kidusan malet memeher Mulugeta ayidelem, Tilik gubae sibisib new. 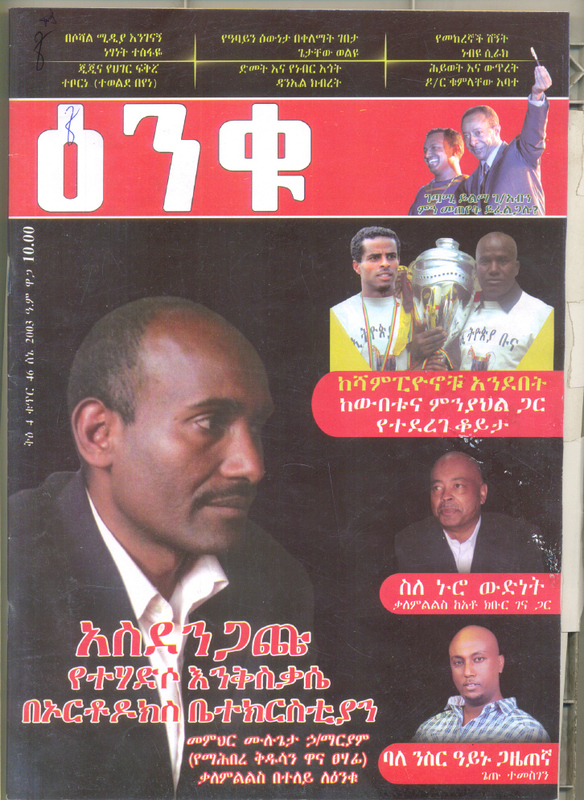 Likawintu, Papasatu, kahinatu hulu yemisatefubet lebetekiristian yetezeregut ejoch endayitatefu defa kena yemil mahiber new. Yihenin Mewidekiya filega yeminkeratet wetat (sebaki tebye) endet abatoch aderaderut. Sewochin leloch kehatiyt (ke esat) mawitat yikelal weyis lesew endiniwededibet enisira. Kesis Solomon tew! Lerasih ewekibet. Memher endemehonih meten ke akalih lelawin yemitimerizibih kalech kuretat. Aliya tekilala hulemenah endayitefa! Bizu yetefu allu. wedeneza fitihin azur. Abate yalitekelewin ane asadigalehum atibel. Getan araya adirig enam teketel. Huklu memiher yerasu yimesilegnal yemilewin menged yizo yehaymanot mehandis hone ekko. ere tewu! It is a good conversation. However, MK should make public all the allegations and the people involved in Protestant-tehadso. 2. What did they do to warrant that accusation? 3. Did you approach them seeking explantion on the bad things they have been doing? 4. If not, why did not you do that? 5. If the church leadership was informed, why did not they summon the accused people and hear what they had to say? 6. For how long can we continue to live in turmoil of this sort? 7. Why would anyone, I mean the suspected p-tehadsos, be allowed to operate in the name of EOTC without the blessing of the church? Eveything that I read points towards the lame EOTC leadership. Alternatively, the leadership may have found MK's accusation as baseless. Or, the tehadso groups may have planted some agents among the leadership to subvert further action against them. Wey gud, Aba Paulos! All this is happening under his leadership. He will account for it to God. I am not blaming him for all mishaps, but he bears the prime responsibility for the mess. God bless you Istifanos and Mulugeta. This is a wonderful achievement in your life. Can you make it readable? It is blurred what ever I make it enlarged. I am having a hard time reading the article attached it is to blurry. Any suggestions? "Bizu yetefu allu. kezih dirigit fitihin azur. Abate yalitekelewin ene asadigalehum atibel. Getan araya adirig enam teketel. Hulu memiher berasu yimesilegnal yemilewin menged yizo YEHAYMANOT MEHANDIS HONE EKKO! Dear Dn. Mulugeta, May be you are EPDRF but I'm not!!! As far as I know MK never asked political affiliation of its member so how could you say "MOST members are EPDRF and its supporters?" "Kesw yiliq lebetekristian yemiTeqim neger mesirat yishalal"
Kale Hiwot yasemalin memhir. But I am disappointed by the senetence “To tell the truth, most of the MK members are EPRDF supporters and members.” I am a member of MK and not a member of EPRDF... May be you are indirectly saying that recently college graduates are being obliged to be members of EPRDF and so a majority of new MK members are also EPRDF members...Still I wish you said it in other words. Questions related to MK services and church problems in general were addressed very well by Memihir Mulugeta. However, as s Dn.Daniel Kibret said in his FB Page, this interview needs correction.As reprimind it is not good habit to give this kind of general and inconclusive addressing.I am member and MK Sira Asftsami member too, but I am not member of EPRDF and also we don't have mandate to say "our members are affilated to any political parties". This looks like "Diha Etse Lisan"
As far as I know MK has not any link with Politics! Majority of politics are false games and Orthodox is truth, my brother why you try to mix up! Sorry, if you think to get some support from EPRDF for MK, it was your wrong tough! We have strong hand that is our heaven Father God, the Son of St. Virgin Marry, you know this badly! For other time please those who are in Head Office discus on these types of issues before it print. Once it print, it is evidence and history! My brother you did all good conversation but with a major bad spot! unconfessable for us who are not member of any political party! God Bless our Genuine Brothers and Sisters who are committed for saving and preserving the church from in and out enemies! Poor Interview and poor man! It is amazing to read this:-" Most of our members are EPRDF's members" If I were a government official, I read it ... Miskine!